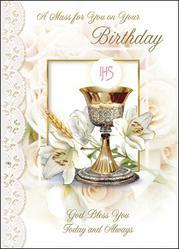 Lourdes Apparitions Birthday Mass Bouquet Card. Card - Birthday Mass Bouquet. 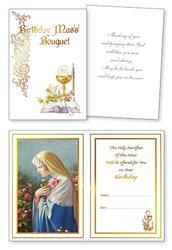 Birthday Mass Card with Gold Foil Embossed. 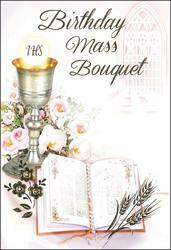 Birthday Mass Bouquet Card with Insert. Card A Birthday Prayer For You. Birthday Card with Insert and Prayer. Birthday Blessing Card - Sacred Heart of Jesus. Birthday Blessing Card - St Therese. 3 Dimensional Birthday Mass Bouquet Card. 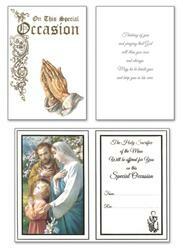 Mary & Joseph Birthday Mass Bouquet Card. 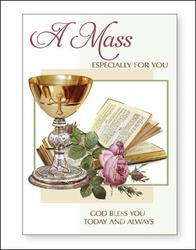 Birthday Mass Bouquet Card with Cross. 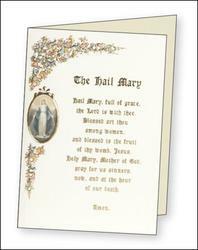 The Hail Mary Blank Gift Card.